Schneit es monentan in China Peak Mountain Resort ?Vielen Dank! 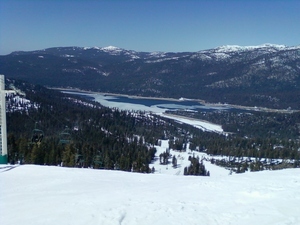 Sierra Summit Mountain Resort is 65 miles northeast of Fresno and has 1,200 skiable acres. They boast a vertical of around 1,600 feet and have 8 lifts service the area. At Sierra Summit Mountain Resort you will find a terrain park and snowboarders have access to all trails. The Sierra Summit Inn on site offers a variety of rooms and suites. Condominiums and hotels are all within 5 to 30 minutes away of Sierra Summit Mountain Resort. RV parking with TV and electrical hook-ups are on-site. I was so surprised. A friend from college (so long ago) and I stay in touch; decided to go with our hubby's and ourselves, no kids! Lol and get away for a few. I was surprised, in aww, shock, and above all elated! Such a great experience: staff were delightful. Clean, fun oh and the slopes lol wonderful powder, powder, powder! Could only wish to find some sort of discount available. Loved this resort! I'm from the east coast. Lesen Sie 1 andere Beurteilungen ueber China Peak Mountain Resort oder geben Sie Ihre eigene Bewertung ab.